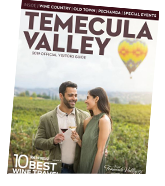 The Xenia Hospitality awards are presented by Visit Temecula Valley (VTV) and are awarded to tourism businesses and individuals who have displayed exemplary hospitality and service to our visitors and community members. The awards were named for the Greek word "Xenia," which is defined as the concept of hospitality, or generosity and courtesy shown to those who are far from home. VTV is a membership-based organization, but recipients of the Xenia Awards are not required to be VTV members. VTV members in good standing may nominate a member or nonmember, individual or themselves for the awards. The Welty Award for Tourism Professional of the Year is presented at the Temecula Valley Chamber of Commerce's Annual Gala in February and the five (5) additional awards are presented at the Xenia Hospitality Award luncheon in March. Would you like to nominate someone for a Xenia Award? Find out more about our nomination process. See the tourism businesses and individuals who have been past recipients of the Xenia Awards. Learn more about how the nominees are screened and selected for the Xenia Awards.